AFC Fylde manager Dave Challinor paid tribute to Coasters duo James Hardy and Jordan Tunnicliffe on their selection for the England C squad – but warned that midfielder Hardy must be handled with care in a season blighted by injury. The 21-year-old is set to be on the bench at least for the friendly against Wales C at Barry Town FC on March 20, having been named in a squad of 16, while defender Tunnicliffe is selected as cover. 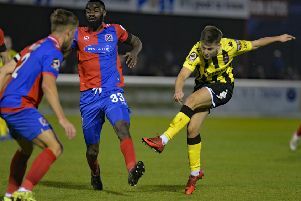 England C is the representative team for non-league players – Tunnicliffe previously played for the national side in May last year and Hardy six months earlier. Coasters boss Challinor said: “Anything that further promotes and enhances our club and our players can only be beneficial. “The two lads have been called up before but there are probably a couple of others in my squad who will think themselves unlucky not to be involved. “As a manager, you take note of the players in the England squad and in my opinion it is full of players who have done really well this season. “It’s a good experience for all the lads involved and it comes at a good time for James because it gives him an extra game in his comeback from injury. “He will go and enjoy that, but he is still a long way behind where he needs to be. “I don’t think that will improve quickly. We have to manage him carefully and get as much as we can out of him between now and the end of the season. “Pre-season will be a really important time for him and hopefully it can get him ahead of the game. Due to injury, he spent a lot of last pre-season catching up. Fylde dropped out the play-off zone following the postponement of Saturday’s visit to Torquay United. The only match in Vanarama National to beat the weather saw Dover Athletic defeat Leyton Orient 1-0 to replace the Coasters in seventh. This was a game in hand for the south coast club, who lead Fylde by two points with 10 to play.